The Ayatana Notification can be clicked through. This means that when you bring the mouse over the notification, the notification fades and you can click on whatever is behind the notification. 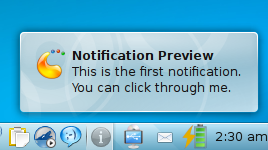 With the KDE Notification this is not possible and you have to close the notification to get to what is below it. Believe me that can become very irritating when there are a lot of notifications at a time. I consider this the biggest single reason why you should use the Ayatana Notification. This is the how the notification normally appears. If you bring the cursor over it, the notification fades and if there is anything clickable underneath, you can click it. The position of the Ayatana Notification can be changed very easily. You can select one position from eight different positions positions along the border. With the KDE notification, however, this is not possible and it appears according to the location of the system tray. We all want our desktop to look better, don't we? The KDE Notification is good looking but the Ayatana Notification is much prettier. Okay many may say that it is a matter of taste. But take a look at the Ayatana Notification and the KDE Notification below and can you seriously say that the KDE Notification looks better? Now if you are ready to enable the Ayatana Notification, you can read how to do it here.